Though I have learned a lot about skincare over the years through reading articles coupled with good ol' trial and error, I am still constantly seeking out new recommendations. My close friend Felicia from ThisThatBeauty.com (I also contribute articles there twice a month) did a blog post about a quick three step routine she was using for her skin and I decided to try something similar! Sometimes the best recommendations can come from a friend, right? It's a quick and simple three step (well three and a half since the peel is two steps) process for glowing skin. Every time I've done this over the past few months, I always wake up with a rested and radiant complexion and have now made this a part of my regular skincare routine. I guess not every night needs to be a 13 step process. Ha! 1. SK-II Facial Treatment Cleansing Oil - Cleansing oils are by far my favorite type of cleansers to use because I find they give my skin the deepest clean without stripping it. I am particularly fond (translation: in love) with this SK-II cleansing oil because it feels like liquid silk on the skin. Seriously! I prefer a cleansing oil formula that is thin and lightweight, emulsifies nicely and rinses away with little to no effort. The SK-II Cleansing Oil removes every single stitch of makeup I am wearing, making it possible for me to even skip my standard double cleanse step. I don't like to skip that step regularly, but on some nights when I just don't have the energy to go that extra bit, I can count on just this cleanser to get the job done. That job being to de-spackle my face. 2. 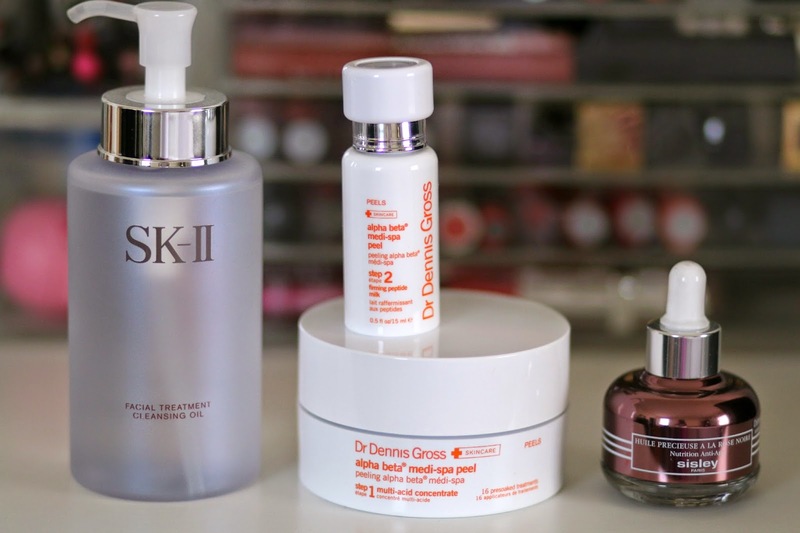 Dr. Dennis Gross Alpha Beta Medi-Spa Peel - I recently did a post on my favorite facial peels, but at the time had not used this one enough to feel comfortable including it in my round up. Now after giving it a go for a few weeks, I am really loving the results. After cleansing the skin, I use this two part peel to give my skin an intense exfoliation, remove any built up congestion, help break up hyper pigmentation and resurface the skin. The first step involves using the pre-soaked pads all over the face (I include my neck and upper chest as well) and I do feel a bit of tingling. Following this step, I apply the firming peptide milk which soaks in immediately leaving no residue or sticky feeling on the skin. It's a pretty strong peel so I like to use this no more than once a week, even once every two weeks. But it's a perfect middle step for this quick 3-step process since it removes all the surface dead skin thus allowing the facial oil to really penetrate into the skin and work it's magic! 3. Sisley Black Rose Precious Face Oil - Though face oils are not so new anymore, many people still worry about the idea of putting oil on their face. Especially those with oily skin. But in my experience (as someone with oily skin), I find facial oils to be the most healing, nourishing, balancing and effective moisturizers for the skin. Face oils can be great layered with other skincare products such as serums and moisturizers, but can also work well when used alone. I actually prefer to use them alone most of the time (unless my skin is really dry and irritated), and this new introduction from Sisley is the ultimate in luxury face oils. It's a dry face oil so immediately after it's applied on the skin, it's absorbed leaving no trace of shine or residue. Because of it's strong healing and nourishing properties, the Black Rose Face Oil helps to replenish the skin's moisture and stimulate it's natural glow. And glow I do the next morning - it's as if all past skin sins are erased and I am starting anew. Is there a Sisley Black Rose Precious Oil I can use for my life?!! !